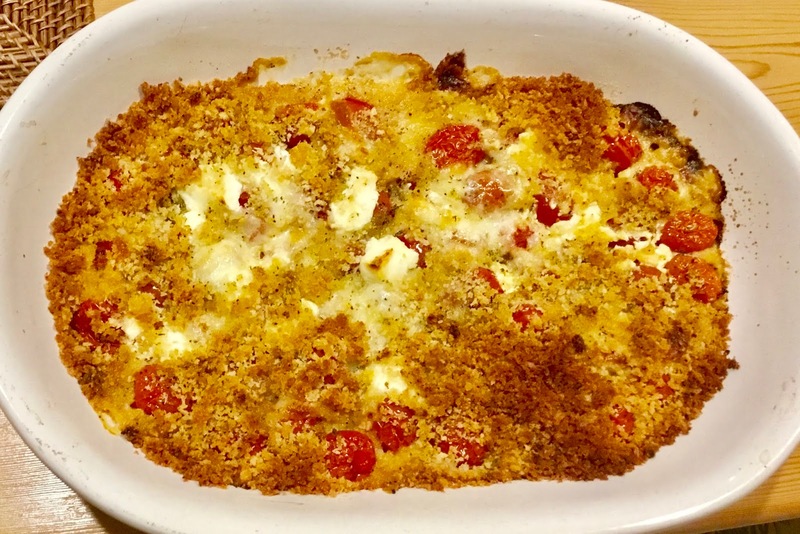 Cherry tomatoes, the petite jewel of the tomato family, so versatile, wonderfully delicious tossed in a salad, added to a casserole or baked parmesan style. I like to serve this dish either a side dish or as a lunch entree with a salad and fresh bread. Preheat oven to 400F. Toss tomatoes in bowl with oil, garlic and oregano to coat. Arrange tomatoes in 10 x 14 x 2 ceramic baking dish. Scatter goat cheese, followed by mozzarella, parmesan cheese and then basil. Combine breadcrumbs, garlic, salt, parsley, and oil. Sprinkle the mixture evenly over the dish. Bake for 40 minutes until bubbly and golden brown. Serve at room temperature. Autumn quietly arrives in New England – crisp mornings turn into warm sunny afternoons with the glorious fall sun setting a few minutes earlier each day: Farmers markets stocked with the last of nature’s bounty before the first frost ends harvesting. Beautiful plump eggplant beckons me as I fill my market basket with copious quantities perfect to make my Baked Eggplant Parmesan. Coming from a long line of Italian cooks I’ve eaten and made this southern Italian dish my entire life. Like my mother I don’t fry my eggplant – I prefer to bake – forgoing the extra fat from frying. And I’ve updated the recipe using Panko bread crumbs for a lighter breading. I love to taste the eggplant, not the breading. 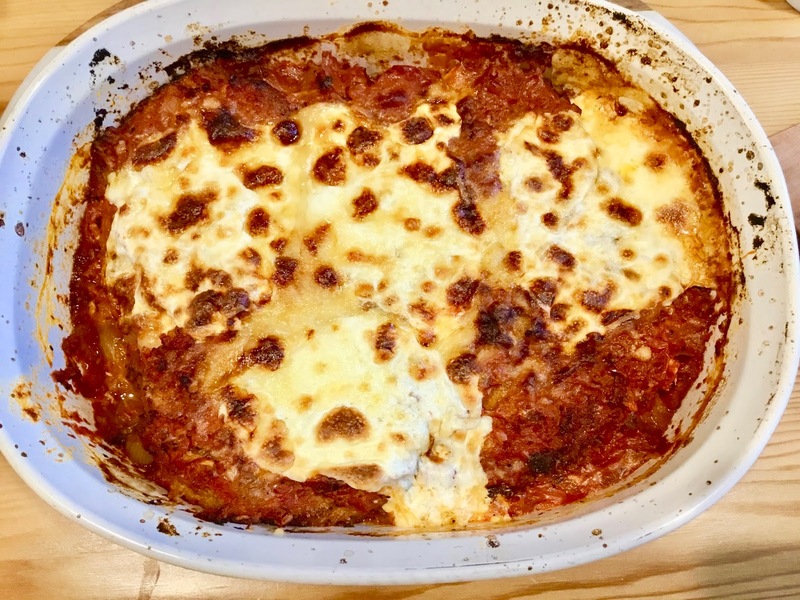 One more item – I only use San Marzano tomatoes. I like my sauce sweeter with less acidity. The San Marzano variety of plum tomato grows in the rich volcanic soil of the Sarno River valley, near Mount Vesuvius, resulting in a sweet flesh with low acidity. Its thick skin makes it easy to peel off. Plus, it’s meatier than Romas and other plums, and has fewer seeds: all good things for making sauce. Like French Champagne, San Marzano tomatoes are grown under strict rules designed to protect and promote regional agricultural products. In Italy, D.O.P. or Denominazione di Origine Protetta rules ensure that only growers within a defined area adhering to specific farming and canning methods can sell tomatoes labeled San Marzano. I assure the extra cost is worth producing the most delectable sauce for all your cooking dishes that require canned tomatoes. Preheat oven to 350°. Heat oil in a large heavy ovenproof pot over medium. Cook garlic, stirring often, until golden, about 4 minutes. Add onion and red pepper flakes, cook, stirring often, until onion is translucent, about 5 minutes. Add tomato paste stirring until combined. Add wine, bring to a boil, and cook until almost completely evaporated, about 1 minute. Add tomatoes, breaking up with your hands, and their juices; add basil and oregano and stir to combine. Swirl 1½ cups water into one tomato can, then the other, to rinse, and add to pot; season with salt. Simmer for 2–2½ hours stirring occasionally. Let sauce cool slightly. Pass through the large holes of a food mill or process in a food processor until mostly smooth. Taste and season with salt. Do Ahead: Sauce can be made 2 days ahead. Cover and chill. Lightly season eggplant slices all over with salt; place in a single layer on several layers of paper towels inside a rimmed baking sheet. Top with another layer of paper towels and more slices; repeat as needed. Top with a final layer of paper towels. Let eggplant sit until it has released excess liquid, 45–60 minutes. This step gives the eggplant a creamy texture when baked. Meanwhile, pulse panko, oregano, pepper, and ¾ cup Parmesan in a food processor until very finely ground. Transfer to a shallow bowl. Preheat oven to 350°. Place flour in another shallow bowl and eggs in a third shallow bowl. Working one at a time, dredge eggplant slices in flour, then dip in egg, allowing excess to drip off. 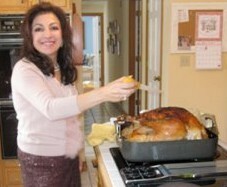 Coat in breadcrumbs, packing all around, then shaking off excess. I don’t fry my eggplant instead I bake. Place eggplant on parchment lined cookie sheet baking for 20-25 minutes until lightly browned. Toss chopped herbs, low-moisture mozzarella, and remaining ¾ cup Parmesan in a medium bowl. Spread 1 cup sauce over the bottom of a 13×9″ baking pan; top with a layer of eggplant slices. Drizzle 1 cup sauce over and sprinkle with one-third of cheese mixture. Add another layer of eggplant, followed by 1 cup sauce and half of remaining cheese mixture. Repeat layers with remaining slices, sauce, and cheese mixture. Cover with foil and bake 45–60 minutes until sauce starts to bubble. Remove from oven and arrange fresh mozzarella over eggplant. 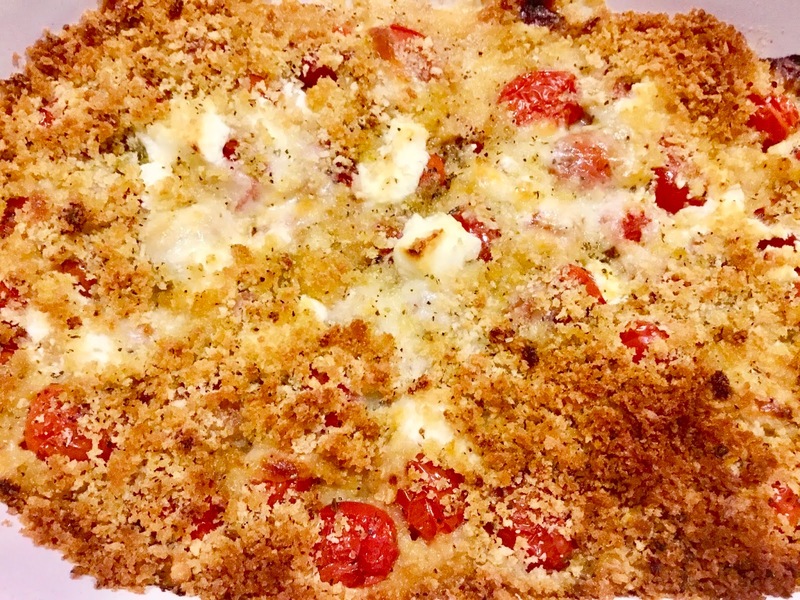 Increase oven temperature to 425° and bake, uncovered, until cheese is bubbling and browned in spots, 15–20 minutes longer. Let rest 30 minutes. Top with basil leaves just before slicing. 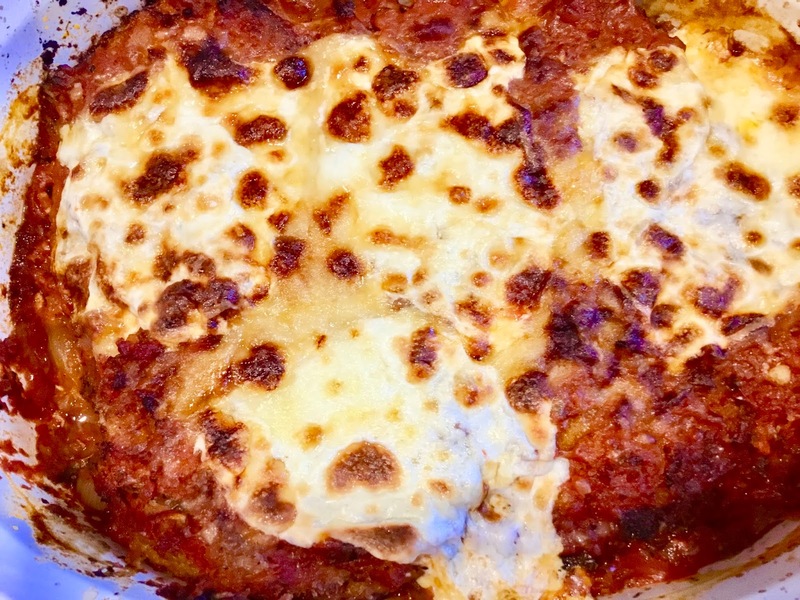 Do Ahead: Eggplant Parmesan can be made 2 days ahead. Let cool; cover with foil and chill. Reheat in a 350° oven, uncovering halfway through, until bubbling gently at edges. * I used Cento San Marzano tomatoes.